A planet has been detected orbiting Barnard’s Star, a mere 6 light-years away. This breakthrough — announced in a paper published today in the journal Nature — is a result of the Red Dots and CARMENES projects, whose search for local rocky planets has already uncovered a new world orbiting our nearest neighbor, Proxima Centauri. The planet, designated Barnard's Star b, now steps in as the second-closest known exoplanet to Earth. The gathered data indicate that the planet could be a super-Earth, having a mass at least 3.2 times that of the Earth, which orbits its host star in roughly 233 days. Barnard’s Star, the planet’s host star, is a red dwarf, a cool, low-mass star, which only dimly illuminates this newly-discovered world. Light from Barnard’s Star provides its planet with only 2% of the energy the Earth receives from the Sun. Named for astronomer E. E. Barnard, Barnard’s Star is the closest single star to the Sun. While the star itself is ancient — probably twice the age of our Sun — and relatively inactive, it also has the fastest apparent motion of any star in the night sky. Super-Earths are the most common type of planet to form around low-mass stars such as Barnard’s Star, lending credibility to this newly discovered planetary candidate. Furthermore, current theories of planetary formation predict that the snow line is the ideal location for such planets to form. 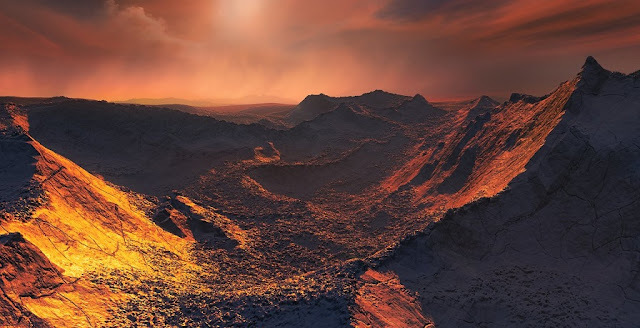 Previous searches for a planet around Barnard’s Star have had disappointing results — this recent breakthrough was possible only by combining measurements from several high-precision instruments mounted on telescopes all over the world.